Treponemal tests: detect the antibodies to Treponema pallidum. eg. Fluorescent Treponema pallidum antibody absorption (FTA-ABS) and microhemagglutination Treponema pallidum MHA-TP). Non-treponemal tests: detect the antibodies produced in response to lipoidal material released from the damaged host cell. These antibodies are traditionally referred to as ‘REAGINS’. eg; Venereal Disease research laboratory (VDRL) and the rapid plasma reagin (RPR) tests. The Rapid Plasma Reagin (RPR) test is a macroscopic, non-treponemal, flocculation card test. It detects the IgM and IgG antibodies to lipoidal material released from the damaged host cells, as well as to lipoprotein-like material and possibly cardiolipin released from the treponemes. The antigen used in RPR is a modified VDRL (Cardiolipin) antigen, in which micro particulate charcoal particles are used to enhance the visual difference between positive and negative results. A cardiolopin lecithin-cholesterol antigen coated with carbon particle is mixed with patient’s serum. 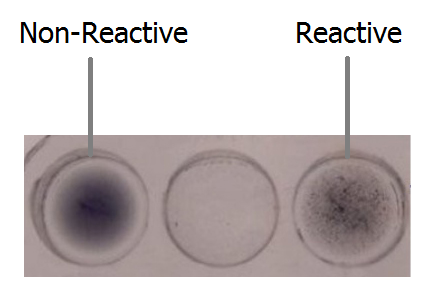 If the specimen contains reagin, flocculation occurs with a coagglutination of carbon particles contained in the antigen suspension, which appears as black clumps. Non-reactive specimens appear as an even light gray homogeneous suspension. Bring the RPR carbon antigen suspension, controls and samples to room temperature. Pipette one drop (50 µl) of the test specimen, positive and negative controls onto separate reaction circles of the disposable slide. Add one drop of well-mixed RPR reagent next to the test specimen, positive control and negative control. Using a mixing stick mix the test specimen and the RPR reagent thoroughly spreading uniformly over the entire reaction circle. Rotate the slide gently and continuously either manually or on a mechanical rotor at 180 r.p.m. Observe for flocculation macroscopically at 8 minutes. Reactive: Indicated by large or small aggregates in the center or the periphery of the test circle. Non-reactive: Indicated by a smooth, even light gray appearance with no aggregates visible. For each specimen to be tested, add 100 µL of 0.9% saline into test tubes numbered 1 to 5. Add 100 µL of specimen onto test tube 1. Mix the mixture. Avoid formation of bubbles. Transfer 100 µL of mixed sample from tube 1 to 2. Repeat this serial dilution procedure in tube 3 to 4, and then 5. Dispose 100 µL from test tube 5 after mixing. Perform the qualitative test procedure using each dilution as test specimen. The titre is reported as the reciprocal of the highest dilution, which shows a positive test result. False positive reactions occur occasionally with the RPR Carbon Antigen test. Such reactions sometimes occur in drug abuse and in such diseases as lupus erythematoaua, mononucleosis, leprosy, viral pneumonia and after smallpox vaccinations. Reactive specimens should be subjected to further serologic study, including quantitation, whenever feasible. The RPR card test cannot be used to test spinal fluids. There will not be a detectable immune response for 14-21 days after exposure. This test is most useful during the secondary stage of syphilis when the presence of reagin peaks, with typical results >1:32. It is less sensitive to primary syphilis, although there is a low level of <1:16 in about 80% of those who come for medical intervention in the primary stage.